When choosing your autumn outerwear there are three essential aspects to look for. The first is style; you should make a visual statement for all the right reasons. Having the best of both worlds, this Reversible Down Vest can be either a beautiful floral design or a subtle navy shade, depending on how you’re feeling that day! Inside is real down for cosy comfort even when it’s cold, which checks off our second key pointer on the check-list: practicality. Last but not least, durability is a must, which is why this is machine washable, making it incredibly easy to care for. It’s true what they say; you can never have enough denim. Whether it’s jeans or shirts, denim is the everyday essential your casual wardrobe loves. The Denim Dress is an autumn must-have – as casual as it is smart, this style is perfect for a mixture of occasions. From autumn walks to weekend shopping, there’s nothing that this dress won’t be appropriate for. When it comes to styling, there are so many opportunities. Try layering under a roll neck jumper to create a 70’s inspired look. Why not add tights and knee high boots? Dress it up or dress it down, this dress guarantees effortless style. With a crisp breeze in the air and brown leaves on the ground, it’s clear that knitwear season has begun. A good jumper should be effortlessly stylish, easy to wear, and timeless, which is why this Heather Knitted Poncho is one of our favourites! Perfect for seasonal layering, it is a contemporary way to add colour to any outfit. With a touch of wool, this poncho is comfortable and soft, and the perfect throw-on-and-go piece for the weekend. What better reason to embrace the chill! Despite the dropping temperatures, autumn wardrobes aren’t just about coats and knitwear. Staying warm is essential but when you’re inside, it’s what’s under the coat that counts. Finding smart workwear is key at this time of the year, as after the scorching summer of 2018 it can be difficult to readjust to winter office dressing. Our Colour Block Panel Sweater makes a perfect seasonally appropriate piece, whilst our Manor House Print Tunic is complimentary in colour and texture. And don’t forget to accessorize with our Asymetrical Wood Bead Necklace! 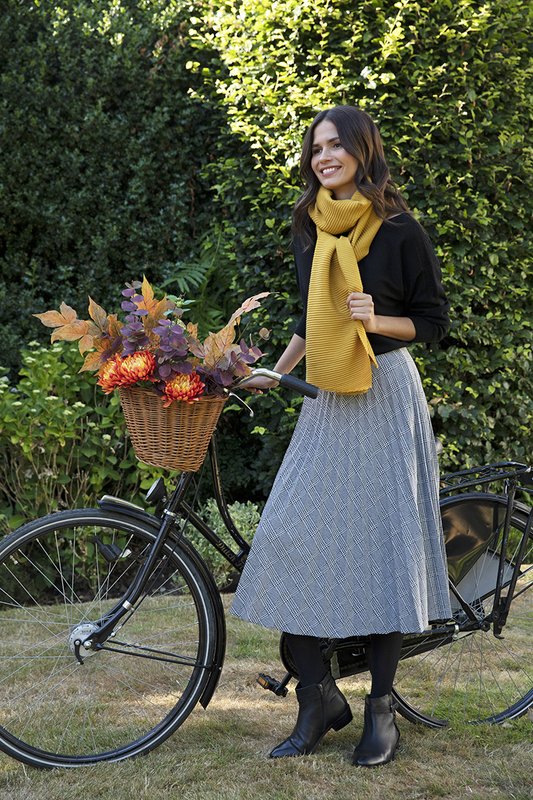 Which piece of our Autumn Walks collection is your favourite? Shop the full collection here, and don’t forget to tag us in your #LauraAshleyUSA outfit pictures. This entry was posted in In Style and tagged apparel, asymmetrical wooden necklace, Autumn, autumn outfit, autumn walks, autumn walks collection, aw18, aw18 collection, cold weather accessories, cold weather apparel, cold weather gear, cold weather outfit, colorblock, colourblock, cosy, cosy knits, cosy poncho, denim dress, denim shift dress, down vest, Fall, fall fashion, fall ootd, fall outfit, fall style, fall wardrobe, fashion, fashion collection, floral vest, fuschia, gilet, jumper, knit jumper, knit poncho, knit sweater, laura ashley usa, laura ashley usa fashion, layered styles, layering, manor house print, navy dress, ootd, plaid, poncho, printed dress, reversible gilet, reversible vest, style, sweater, vest, wardrobe, winter fashion, winter outfits, winter style, winter vest, women's fashion, womens style. Bookmark the permalink.